Let’s wag our fingers while we howl our hollow laughs: Mitt Romney is the focus group’s love child, the marketer’s political pin-up, the self-proclaimed experienced “leader” who displays mere salesmanship. He transforms like a shape-shifter on abortion and global warming and mouths opinion-poll platitudes: Obama is an appeaser, a socialist, a failed CEO. 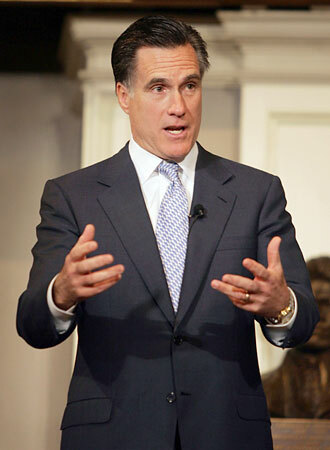 Romney, the contemporary synthetic candidate, trashes substantial and crucial argument like so many wads of waste paper. Who knows? He may ply his way into the White House like Jack Kennedy, who won the 1960 election because of a better make-up artist (lucky for us, he made a decent president). Pin a polka-dot tie on him and put him in a used car lot. Easy targets like Romney blind us to our murky secret: We, the supposedly innocent electorate, made him. The American character has sunk to such nihilistic depths that we prefer the marketer over the leader. We repeatedly vote in the dealers and peddlers and negative campaigners. We claim we want the truth but reward professional presidential candidates like Mitt Romney. We’ve laid the lot on which they hawk their jalopies, then complain they’ve sold us lemons. Not to drill the point home or anything, but we get the people we vote for. We’re the problem. Romney is a symptom, not the disease. We’d cultivate Joshua 1:6 if we wanted true leadership. God counsels Joshua: “Be strong and courageous” and repeats the call in verses 7, 9, and 18. Think of Aung San Suu Kyi, the Burmese opposition leader who walked alone in the face of soldiers aiming guns with shoot-to-kill orders in 1989. A major countermanded the order at the last moment and she lived – only to spend many subsequent years under house arrest. Think of Nelson Mandela and his 27-year prison stint or Mother Theresa in Calcutta’s slums. Or think of the heritage in Romney’s own party: Theodore Roosevelt bucked the special interests, busted huge trusts, and befriended the infant labor movement while cultivating a business-friendly environment; Thomas Dewey, who would eventually become one of the New York’s greatest governors, boldly walked through the city streets when he was a prosecutor, knowing mobsters had ordered a hit on him. Dewey lost the 1948 presidential election when he uncharacteristically withheld his views and tried to coast into the White House, but his influence played a crucial role in the formation of the moderate Eisenhower Republican. Real, courageous leaders weave in a second biblical attribute, wisdom, and use their salesmanship (a necessary and laudable political skill) to cast a vision in which we rise above ourselves. They’ll yield on peripheral issues — and they’ll slap backs and kiss babies and laugh at bad jokes and compliment cooks on their overcooked chicken — but they don’t surrender their core beliefs. They advocate. They unabashedly argue. They don’t blink at the overwhelming evidence of human-induced climate change; they don’t flip-flop over issues of life and death. Indeed, the examples of Suu Kyi, Mandela, Roosevelt, and Dewey show that real leaders are willing to sacrifice everything — including themselves — for their cause. And it’s working. Romney’s flip-flopping won him the Iowa caucuses and the New Hampshire primary despite GOP distaste for him — and polls suggest a plurality of South Carolina Republicans will follow their path. They know he’ll “soften” or “moderate” his views once he pockets the nomination; they suspect his Massachusetts record betrays his true identity as a Dewey Republican — but they so hate Obama and “Obamacare” they’ll vote in the sponsor of Obamacare’s mother, “Romneycare.” They’re knowingly choosing the most flagrant political chameleon so they can win — and “winning” (which equals capturing the White House and nothing more) is everything. True leaders are risk takers by nature. Political chameleons pose as leaders and look like leaders — they may even boast leadership resumes — but they’re counterfeits. They take no risks and blend into the scenery while branding themselves as “outsiders” — because it’s all about branding and everyone wants an outsider. And we’re voting for him anyway. Unless Americans wake-up to their own self-delusion, one of the nation’s two great parties will knowingly nominate a computer generated hologram of a candidate whose only demonstrated conviction is a desire to become president. He is his own goal. We claim we want courage and conviction and character, but the ugly truth is we would never vote for someone like Mandela or Suu Kyi — and Roosevelt and Dewey wouldn’t even be recognized as valid Republicans. The real scandal is that Mitt Romney is the image in our own mirror.